Saturday in New York City. Upper East Side, Lexington and 84th. Holly’s lived in this charming corner apartment on the third floor for 14 years. Needless to say, the rent is a steal, and it is a charming neighborhood. Last night we walked a few blocks down to Tiramisu, a local Italian restaurant. It was about nine o’clock and the restaurant was crowded as we arrived. Fortunately, the maitre d’ was someone that Holly had known several years ago so we were seated quickly. In fact, they must have been good friends, because he came back and refilled our glasses of wine and was very attentive. The food was good – it is a neighborhood type of restaurant – satisfying but not too fancy. I had the daily risotto special, which featured asparagus, arugula, and large fresh shrimp. Interestingly, it was served in a hollowed-out grapefruit perched atop additional risotto. Tasty. The tiramisu itself was fantastic, a good size brick that Holly and I shared. Hard to believe, or maybe not so hard, that the time has come for my move. After several years of possibility, sixteen months of planning, and three months of actual organization and execution, the day has arrived. The first twenty-two plus years were stationary; the next dozen have been downright nomadic. This morning I met my protoge and now boss, Kim Fordham, for brunch at Danal – a fantastic, eclectic brunch place that looks like your English great-grandmother’s back patio. It was very nice. While waiting for Kim and her friend Pat, I sat on a bench in the front window and played with the resident cat, a fat white and black long-hair. She was quite fond of me and I spent the remainder of the afternoon removing white cat fur from my black wool jacket. During the afternoon I browsed at Strand Books, one of the largest used bookstores in the world. I picked up Ruling Your World: Ancient Strategies for Modern Life by Sakyong Mipham. While the book doesn’t have anything “new” to say – common sense, really – it is interesting to read how the basic messages of not being so centered on “me” are packaged. Bonus: Last night I took my thirteen months’ collection of coins to the grocery store. After CoinStar’s 8.9% service charge, I still had $108.36. Enough to pay for my cab from LaGuardia and then to JFK airport. Ha. Second Bonus: Here’s a photo I snapped at my bon voyage party thrown by my sister, Jennifer, last week. 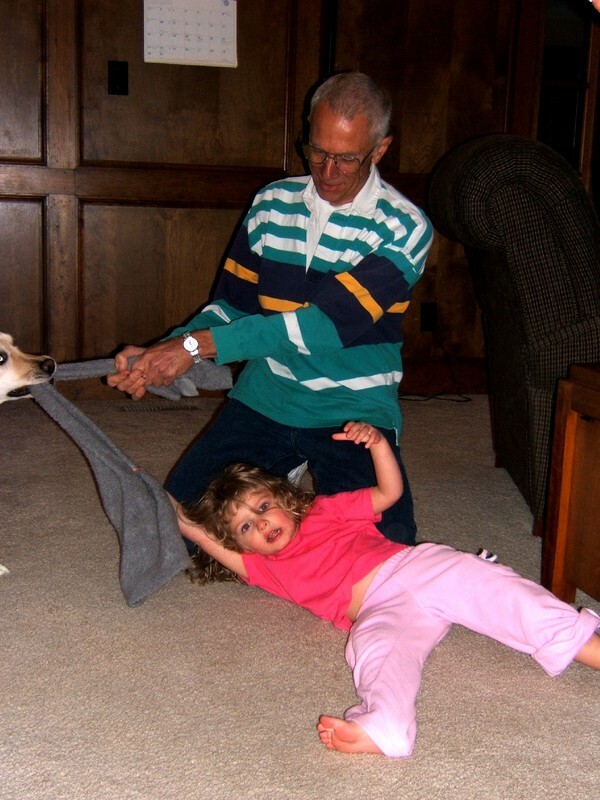 My niece, Emily, my father, and Jennifer’s dog Zoe were in a three way tug of war in which Emily ended up the loser! Many thanks to Jenn and Kevin for hosting the party. It was a lot of fun to spend time with all our family members as well as dear friends. This entry was posted in Personal, Travel and tagged family, New York, nyc, travel by christao408. Bookmark the permalink.